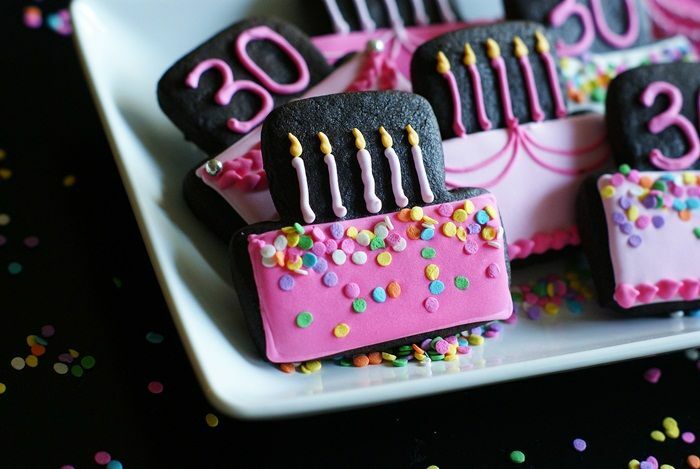 Chocolate Peanut Butter Cut-out Cookies...and a very special birthday! I've talked before about how my very favorite part of blogging is something that I never, ever expected. I always thought the sugar would be the highlight of blogging, but no...it's the people I've had the pleasure to meet. That leads me to Jessica from the blog, How Sweet It Is. Now, Jessica has been one of my favorite bloggers for a long time. I love this girl. I admire Jessica for her amazingly creative and delicious recipes...her stunning photography...her hilarious sense of humor and writing...her impeccable style...her blogging and social media smarts...and her beautiful, fun spirit. In August, I met Jessica and I can tell you, she's even more lovely in person. (I won't hold it against her that she was BORN just about the same time I was going to see Grease 2 (2!) with my fellow 13-year-old girlfriends.) I wanted to make a little something to celebrate her big day. I just had this inkling that Jessica likes peanut butter and chocolate. Maybe it was Jessica's Peanut Butter Stuffed Hot Fudge Cupcakes, or Chocolate Chip Cookie Dough Peanut Butter Cups, or Peanut Butter Fudge Brownie Trifle, or maybe Peanut Butter S'mores Squares...I sensed a trend. So, I made cookies. I made Chocolate Peanut Butter Cut-out Cookies. And, y'all...you need to make them, too. In a large bowl, use a paddle attachment to beat the butter and sugar together until light and fluffy. Beat in the peanut butter until smooth. Beat in the egg and vanilla. In three additions, add in the flour mixture beating on low until just combined. Scrape the bowl to incorporate any dry bits on the bottom of the bowl. Divide the dough in half, form into two discs, and wrap in plastic wrap. Refrigerate at least 30 minutes. Mix flour and cocoa powder together to coat the rolling pin and rolling surface. Roll the dough to about 1/4"-3/8" thickness. Freeze the cut-outs on the cookie sheet for 10 minutes before baking. Bake for 9-12 minutes. Cool on the cookie sheet for 1 minute, then remove to wire rack to cool completely. Decorate as desired with royal icing. WHAT!! I cannot even believe this. I am totally blown away! Really, I don't even have words! Thank you so, so, so, SO much for this Bridget! It means more to me than you can even imagine. You are my inspiration! xoxoxoxo times a million. Happy Birthday to a sweet friend! And wow, Bridget...these look amazing. Maybe even for a 40th or 50th birthday even? You are so sweet for doing this! And just what the birthday girl needs - pb, cake cookies, pink AND sprinkles. These are gorgeous and sound SOOO yummy and can't wait to try them!! I am curious about one thing though... would you mind telling me why not 'all natural' peanut butter? Absolutely beautiful. I love this post, and of course, the incredibly sweet cookies. 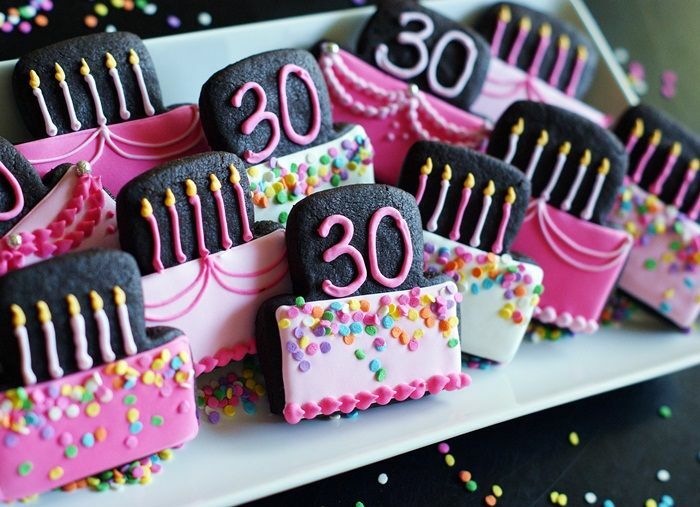 Happy 30th to Jessica! What a sweet gesture for a lovely lady! These are way too cute. 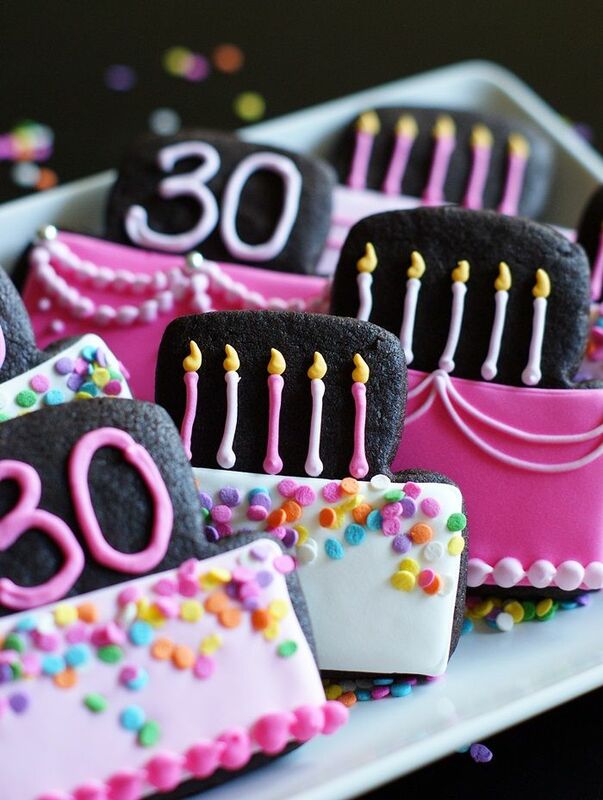 Oh my goodness, another wonderful new roll-out recipe and executed so beautifully on these birthday cookies! oh my gosh those sound great, and how cute are they! Aww I just LOVE this!! Happy Birthday Jessica!!! these are SO cute! you continue to amaze! They are so beautiful! You're so sweet, Bridget!!! Happy Birthday to Jessica!! How sweet of you! These are perfect! Happy birthday, Jessica! Bridget, these are FABULOUS! They sound delicious and look absolutely gorgeous! Yes, an awesome present for an awesome birthday girl!! This is the sweetest.thing.ever. They are absoluately gorgeous! One year for my bday years ago my husband bought me a hot pink cake that was in the shape of a high heeled shoe. I will always cherish that memory and these remind me of that but more gorgeous. You are SO SWEET Bridget! This is so gosh darn sweet of you. You know... My birthday is coming up soon, too. Like... Whenever you want to make these again? Yup, that day will be my birthday. Sorry about that! I was trying to comment under my 'cookie name'. Oh well! Either way, thanks for posting this! It sounds delish! The cookies are quite cute too! What a sweet, yummy gesture! Beautiful Cookies! Happy Birthday Jessica! 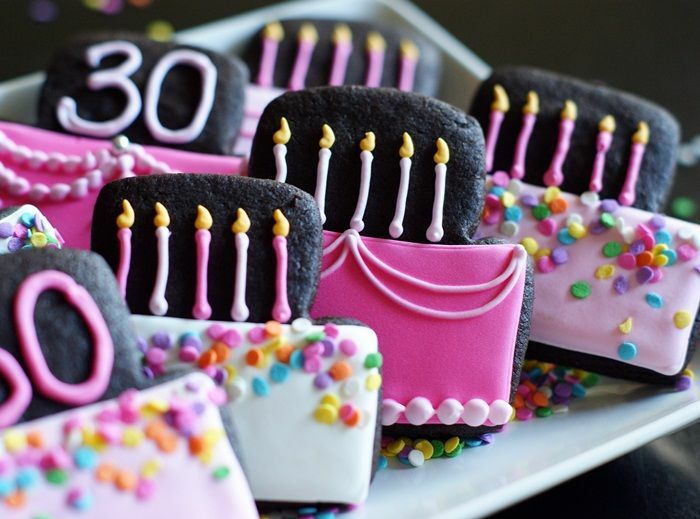 I actually prefer cookies over cake (gasp); but like everyone else feel that if there is a birthday there must be cake. Serving these festive cookies solves that issue. Awww, this was such a sweet post. Those cookies are completely amazing!!! You were definitely spot on with the chocolate peanut butter flavor! Jess is the best. I just love that girl! Wow, what a great demonstration of beauty all round. Taking the time to make and decorate these cookies is a beautiful act, then including all of the best birthday wishes to Jessica is another beautiful thing to do and the cookies themselves are amazingly beautiful. Finally, what about Jessica's comments? She is So appreciative, yes that's right - beautiful. Reminds me of when I came home from yet another hard days work to find that my daughter had made a batch of white chocolate mud cupcakes. She took the time to frost them with white chocolate ganache then used those silver candy balls to write our names on top. Beautiful and we all know that the world needs a lot more beautiful people and actions toward each other, right? I'm not a big fan of peanut butter but I guess these cookis would look just as lovely with any cut out recipe. They are adorable and perfect for any birthday celebration. Thank you! Happy Birthday Jessica! These look awesome!! 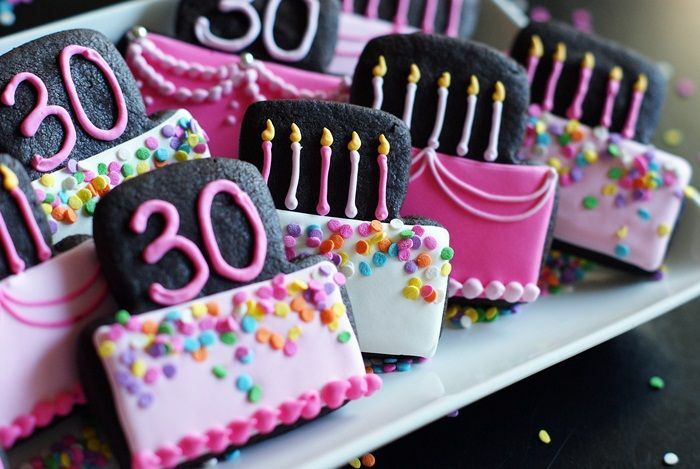 Did you use a "cake" cookie cutter for these amazing cookies? I love them-and Happy Birthday to Jessica! What an awesome gift! These sound absolutely fabulous! Chocolate and PB is always a winning combo, and one perfect for Jessica! I can't wait to try this recipe!! Adorable cookies!! I love the pink with the dark background. love how you decorated these. Cute idea. You are such a sweet friend! You are so so sweet! What a fun surprise for her. Those cookies are just darling! so pretty! i love her site. I can't believe these are pb and chocolate cut outs. YUM!! So cute. I bet the c&pb combo is delicious! These cookies are darling and they sound heavenly. What a nice friend you are to bake these for her. Seeing these cookies just makes me happy. They're all so festive and colorful!!! You are so sweet Bridget! I'm sure every bite of these cookies will be savored with utter delight. Most MAGICAL Birthday Cookies EVVVVVVVer! Happy Birthday to one of the hippest~coolest girls FOODIE Rockstars ever! These are the very sweetest cookies! I love Jessica's blog, she has such a funny sense of humor! Just about anybody could find something to relate to in her blog, and that is what I love about it, it's just so real and she seems so down to earth! These cookies not only sound/look delicious, but are such a "sweet" gesture! I love chocolate and peanut butter and so want to try your wonderful recipe. 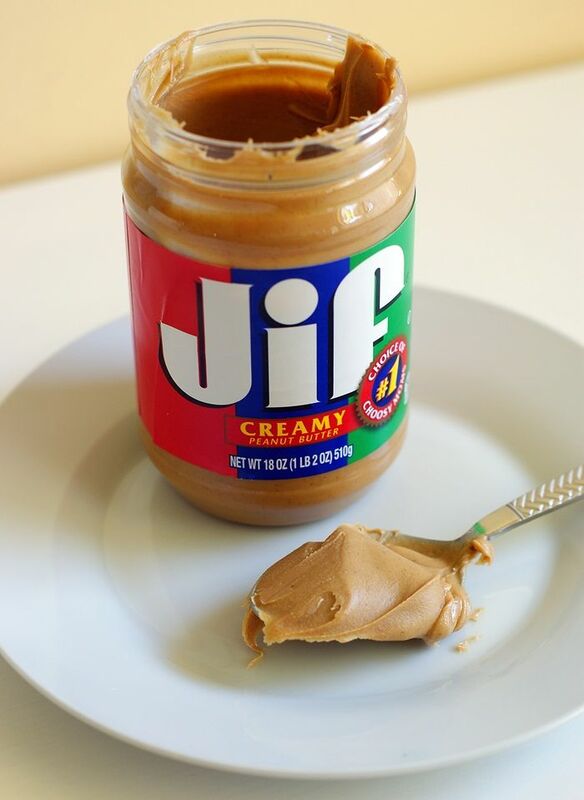 I dont have regular smooth peanut butter but the natural kind, will it work ok or how do I use it in the recipe :) thanks for sharing. I really like Jessica's weblog, she has such a crazy feeling of humor! Just about anybody might discover something to connect with in her weblog, and that is what I really like about it, it's just so actual and she seems so down to earth!